Surprise View Cottages01751 431335work Self-cateringNestled on a farmstead in the North York Moors National Park at the lower end of Farndale, famous for its wild daffodils, these historic barn conversions are designed to provide home from home - comfort being the key word! The properties are well-equipped with full central heating, new electrical goods and well-stocked kitchens. Furnishings, fabrics, bedding and room layout are all planned with the discerning guest in mind. The cottages are on a working farm keeping cattle and sheep, with the owners David & Ruth Wass now living on-site; it has been farmed by our family for over two hundred years. The cottages overlook ancient stone buildings which once housed a mill and tannery, also being worked by our family over two centuries. Each of the cottages has a south-facing stone-paved patio area with benches and seating. Surprise View Cottage has flower troughs bordering the tiny mill race running along one side, and a fenced lawned area looking over fields, woods and the valley of Farndale. 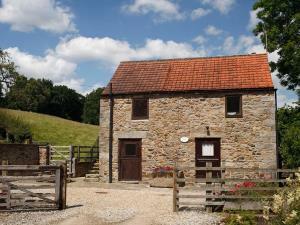 Field Barn Cottage is set just up the hill enjoying panoramic views over fields, woods and the moorland edge. Whichever of the cottages you choose you will find that guest's needs are comprehensively met; the cottages are all stylishly furnished but above all :- comfort is the keyword!